Group II introns are mobile genetic elements that form conserved secondary and tertiary structures. In order to determine which of the conserved structural elements are required for mobility, a series of domain and sub-domain deletions were made in the Lactococcus lactis group II intron (Ll.LtrB) and tested for mobility in a genetic assay. Point mutations in domains V and VI were also tested. The largest deletion that could be made without severely compromising mobility was 158 nucleotides in DIVb(1–2). This mutant had a mobility frequency comparable to the wild-type Ll.LtrB intron (ΔORF construct). Hence, all subsequent mutations were done in this mutant background. Deletion of DIIb reduced mobility to approximately 18% of wild-type, while another deletion in domain II (nts 404–459) was mobile to a minor extent. Only two deletions in DI and none in DIII were tolerated. Some mobility was also observed for a DIVa deletion mutant. Of the three point mutants at position G3 in DV, only G3A retained mobility. In DVI, deletion of the branch-point nucleotide abolished mobility, but the presence of any nucleotide at the branch-point position restored mobility to some extent. The smallest intron capable of efficient retrohoming was 725 nucleotides, comprising the DIVb(1–2) and DII(ii)a,b deletions. The tertiary elements found to be nonessential for mobility were alpha, kappa and eta. In DV, only the G3A mutant was mobile. A branch-point residue is required for intron mobility. Group II introns are catalytic RNAs that are also mobile genetic elements. Although their primary sequences vary considerably, the intron RNAs fold into well-conserved structures (Figure 1). The generalized group II intron secondary structure consists of six helical domains emerging from a central wheel [1, 2]. 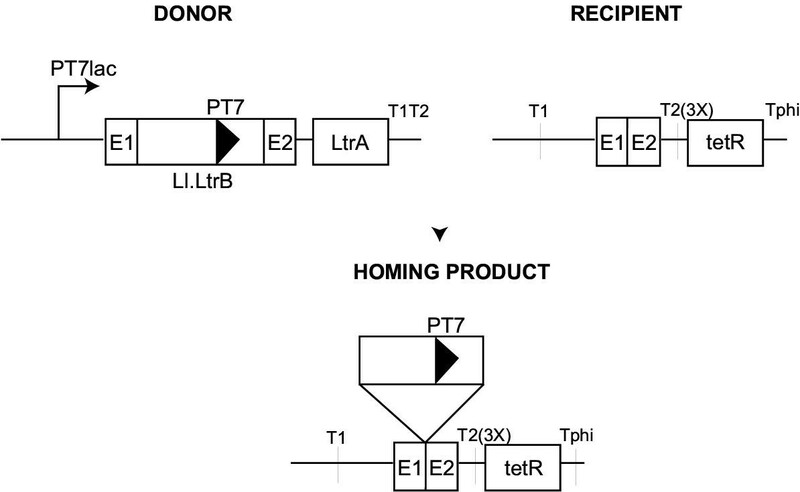 Some group II introns are capable of self-splicing; however for efficient splicing in vivo, the intron-encoded ORF or host-encoded splicing factors are required . Mobile group II introns encode a reverse transcriptase/maturase, with the coding region generally located in domain IV. Secondary structure model of the Ll.LtrB group II intron. The model is based on the general structure described for group IIA introns in Toor et al., 2001 . The bottom structure depicts the entire intron, while the one at the top is a detailed representation of DIV. Domains are indicated by Roman numerals I-VI and sub-domain structures are denoted by letters and numbers. EBS and IBS interacting elements are marked and tertiary interactions are represented by Greek letters. η, η' and ζ elements are marked with dotted lines because of uncertainty in their prediction. The point mutations and deletions (whose boundaries are defined by brackets) are shown in gray. Group II introns were first identified in fungal mitochondria and grouped on the basis of their secondary structures [2, 4, 5]. They have been found in organelle genomes of fungi and plants and also in a number of bacteria . None have been found in animals, although it has been suggested that group II introns may be progenitors of nuclear spliceosomal introns based on similarities between nuclear pre-mRNA splicing in eukaryotes and the splicing mechanism used by group II introns [7, 8]. In the first step of splicing, there is a nucleophilic attack by the branch-point residue on the nucleotide at position 1 of the intron, resulting in a lariat structure with the intron remaining attached to the 3' exon. The second transesterification results in exon ligation with the release of lariat RNA complexed with the intron-encoded protein. This ribonucleoprotein (RNP) complex is an endonuclease, which can initiate reverse splicing into an intron-less target site in a process known as retrohoming . After the intron RNA reverse splices into one strand of the double-stranded DNA, the intron-encoded protein cleaves the other strand at position +9 or +10 downstream of the intron insertion site, and the generated 3' end of the second strand is used as a primer for reverse transcription of the inserted intron RNA. Integration of the resultant cDNA occurs via the host's recombination or repair mechanisms. At this point, however, it is not clear what the exact structural requirements for retrohoming are, or which tertiary interactions are dispensable for the reaction. This mutational study is an effort to understand what structural features of the intron RNA are important for mobility and to utilize that information to construct a minimal intron capable of retrohoming. The development of a core functional intron would be interesting not only from an evolutionary perspective, but would also facilitate manipulation in the laboratory. Domain I possesses numerous intra- and inter-domain interactions by which it serves as a scaffold for intron folding. It associates with domain V to form the catalytic core. It is also important for recognition of the 5' exon in cis splicing reactions and for targeting DNA or RNA in reverse splicing . Not surprisingly, deletions in sub-domain structures, particularly Ic, greatly diminish mobility. In this report, the ratio of amp R tet R to amp R colonies of each mutant, normalized to the wild-type ratio, was used as a measure of mobility frequency. It is important to note that for mutants with a very low mobility (≤ 0.001%), this ratio may not reflect mobility frequency due to background tet R colonies and it was necessary to verify intron insertion by PCR analysis. Only two deletions in domain I retained some mobility; domain Ib, 0.06%, and the κ helix (nts 190–204), 0.37%. The Ib deletion mutant had a mobility frequency of 0.06%, which may indicate that the α tertiary element is not absolutely essential for mobility. This result is interesting in that only the α deletion mutant is mobile, while both the α' deletion and the α-α' double deletion are not. This is in contrast to the results of splicing assays with the group IIB introns aI5γ and Pl.LSU/2, where it has been shown that the α-α' interaction is essential for splicing [10–12]. This discrepancy could reflect the fact that the mobility assay is more sensitive and can detect greatly diminished levels of splicing and mobility. 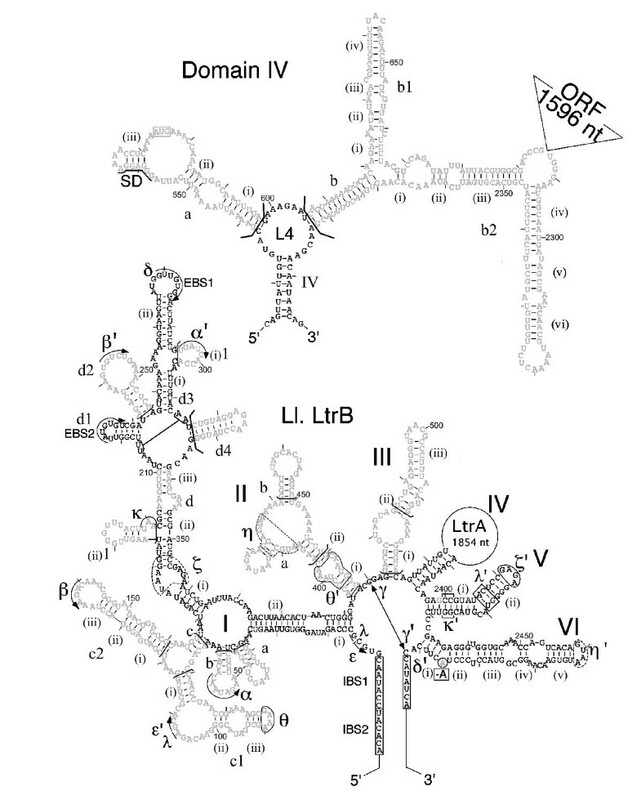 It is also possible that other structural features of Ll.LtrB or its interaction with LtrA protein help it properly orient important regions flanking the α element. Based on an earlier secondary structure of the Id(i-iii) region, the κ helix included positions 190–204 (Figure 2a). A deletion of this sub-domain resulted in a frequency of 0.37%. However, when the structure was redrawn based on comparative analysis (Figure 2b) , and the new helix containing the κ interacting element was deleted (nts 185–201), the frequency dropped over 1000-fold. These results imply that the κ-κ' interaction itself may not be essential for the activity of the intron, but the overall structure of this region is critical. This is further indicated by the deletion of the helix just above it (nts 205–210,339–346), for which no mobility was detected. The finding that κ-κ' is not essential is similar to a finding by Costa et al., 2000 for the Pl.LSU/2 intron in which a deletion of the entire ID(ii)a stem loop containing the κ element was still capable of splicing . Additionally, this element is absent from the introns S.p.cox2 I1, P.a.cox1 I4, A.m.cox1 I3 and P.a.cox1 I1, along with Id(ii)1 . The loss of the interaction might also be compensated for by the intron-encoded protein. This is supported by a strong protein enhanced crosslink between U191 (near κ in domain I) and C2421 (near κ' in domain V) (Noah and Lambowitz, unpublished data). Different local structures surrounding the κ element in domain I. Figure 2a indicates the deletion of nts 190–204 that had a mobility frequency of 0.37% while figure 2b (deletion of nts 185–201) had a mobility frequency of <10-4. None of the other 11 sub-domain deletions in domain I were mobile. Even the double deletion mutants α-α' and β-β', which presumably affect local folding and hence could be less deleterious overall, did not restore mobility. The observed homing frequencies in the range of 10-3 – 10-4%, are close to the background level of appearance of tet R colonies (~10-3 %). Surprisingly, neither the single nor the double deletions involved in the β-β' interaction are mobile. This interaction is not well conserved and is missing from some introns classified into the following structural categories: bacterial classes B (B2-like intron structure), C (novel hybrid) and D (unusual B-like) . However, this region may be involved in protein interactions, based on strong protein protections observed in this region . Strong protein protections are also observed in the Id4 terminal purine-rich loop. In fact it is these two sites in DI, which exhibit the strongest LtrA protections . From the mobility analysis it is clear that deletions in sub-domains IIa and IIb are mobile to some extent, while a complete deletion of domain II is not functional. 100% of the colonies picked from both deletions were true homing events (10/10). This is consistent with previous reports where Bachl and Schmelzer (1990)  showed that a partial truncation of DII leaving a short hairpin in the intron bI1, had no pronounced effect on splicing efficiency, whereas a complete deletion eliminated the reaction. This was also demonstrated in aI5γ . The II(ii)a,b deletion of nucleotides 404–459 was mobile to a small extent, (frequency 0.23%). This region includes the η interacting element, indicating that it may not be essential for mobility. The η-η' interaction has been primarily observed to mediate a conformational change between the two steps of splicing . It is also missing from some mitochondrial class A1 and bacterial classes B, C and D intron structural groups, which may indicate that it is not absolutely essential for splicing. Many reports indicate that domain III is absolutely required for splicing in vivo and in vitro. Although its exact function is unknown, it has been speculated to be involved in the formation of the catalytic core . Besides this, it was shown for the group IIB intron aI5γ that the phylogenetically conserved basal stem loop contains one of the most internalized regions of the molecule . Here it was found that neither deletion in domain III could be tolerated. Frequencies were at the background level in both cases (<10-3 to 10-4 %) and no bona fide homing events were found. 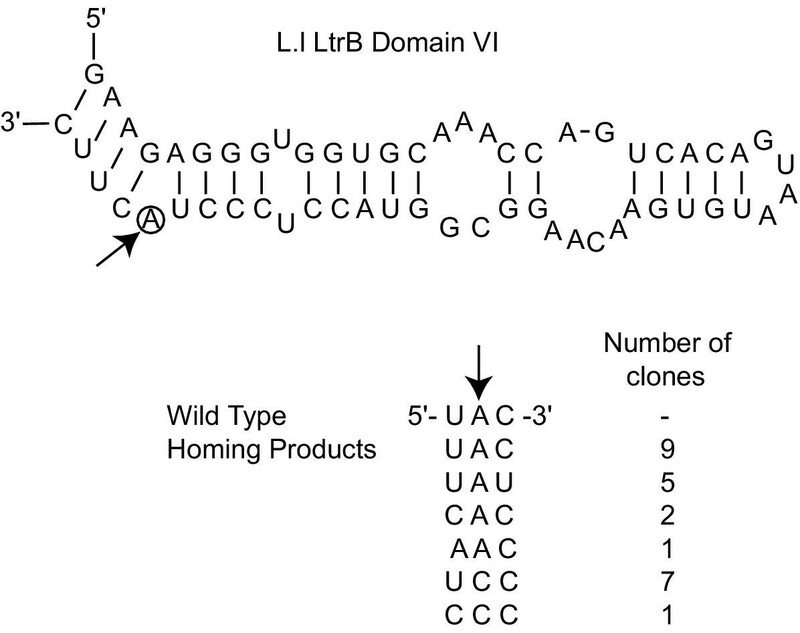 Domain IV is the most variable domain and has not been shown to have a large effect on either splicing or mobility. In fact the mobility frequency of the DIVb(1–2) deletion is almost 70% of the wild-type intron, which is the highest mobility observed for any deletion in this report. In this case, 10/10 colonies tested were true homing events. Surprisingly the deletion of DIVa (which is the primary binding site for LtrA) exhibited a low level of mobility (6 × 10-4%), although the number of true homing events was only 60 – 80%. This is likely due to residual binding whereby LtrA recognizes other features of the intron to promote splicing and mobility [[14, 18], Cui and Lambowitz, in preparation]. It had previously been reported that the invariant G at position 2 of the catalytic AGC triad in domain V was critical for self splicing in vitro and in vivo. Here, point mutants of this residue were made. Although the mobility frequency (3 × 10-3 – 0.25%) was greatly diminished, G3A was the least affected presumably reflecting a requirement for a purine and/or base pair at that position, whereas G3C and G3U had frequencies almost 100-fold lower. Interestingly, it was observed upon sequencing the isolated homing products, that G3C and G3U were revertants back to G, the wild-type nucleotide. By contrast, the G3A colonies were verified to involve integraton of the G3A intron. For the G3C and G3U revertants, the donor plasmids from these tet R colonies were also isolated and sequenced to verify that they had the original mutations. In a mutational analysis of the same triad in the aI5γ intron, it was found that mutations at G3 were some of the more deleterious ones in DV . Revertants that restored base pairing were also identified. Further, the G3U mutant could not be rescued but the G3A mutant could, suggesting that a purine is required at this position, as seen in Ll.LtrB. A deletion mutant of the branch-point A (ΔA54), along with the other three substitution mutants A54G, A54C and A54U were tested. Interestingly, the ΔA54 mutant gave a frequency of 0.003%, but upon sequencing the homing products, no true ΔA54 mutation was found. Instead, a variety of sequence changes surrounding the branch-point A were observed in the homing products, although the original deletion mutation remained the same in the donor plasmids (Figure 3). It appears that this mutation can be rescued by many kinds of secondary mutations as indicated. It was reported that group II introns could go through a hydrolytic splicing pathway to generate a linear intron even without a bulged nucleotide . Our findings suggest that if a linear intron is generated by hydrolytic splicing of ΔA54, it is unable to carry out mobility. Hence, the branch-point nucleotide is absolutely required for mobility. Summary of sequencing data obtained for the branch-point A deletion mutant (A54) homing products. These data are the combined results for introns with and without the 158 nt DIVb(1–2) deletion. Recently, the crystal structure of a 70 nucleotide RNA containing domains V and VI of the aI5γ intron was determined . Surprisingly, it revealed 2 bulged nucleotide residues in DVI instead of one. 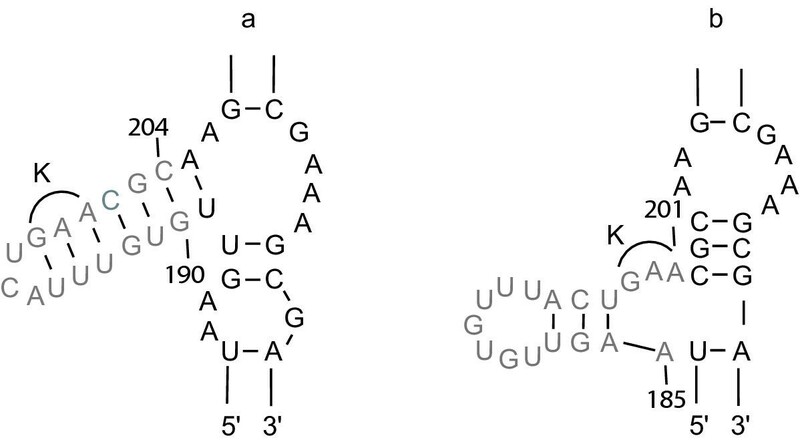 In aI5γ it is the branch-point A and the following 3' nucleotide which is a U, that are both bulged out. This appears inconsistent with the revertant sequences here, which show selection for a Watson-Crick base pair at the position 3' but not 5' to the branch-point nucleotide. Support for the observations in this report comes from work by Chu et al., 2001  on the aI5γ intron, in which they propose that a 4 bp stem 3' of the branch-point is one of the determinants for branch-point activation. Additionally, they state that a G:U wobble pair above the branch-point is also a determinant, which fits in with the observation that a non-canonical pair (A:A or A:C) is found at this position in some of the revertants. More recent support for this upstream weak or non pairing with simultaneous downstream pairing, was observed in all lariat forming group II introns in barley chloroplasts . 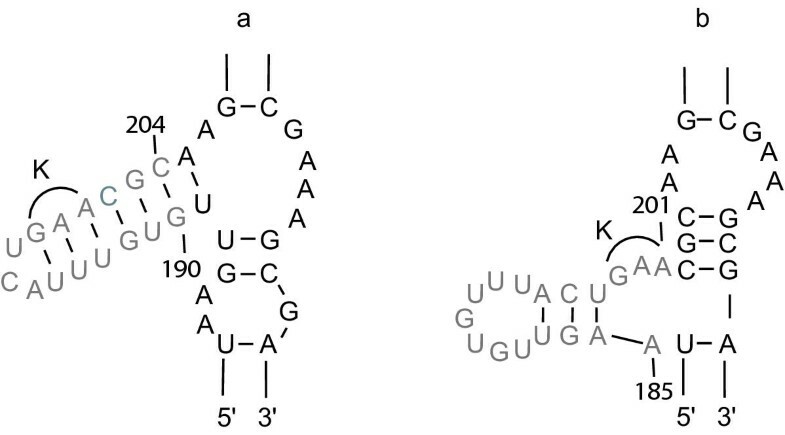 Here 13/16 introns lacked Watson-Crick pairing above the branch-point A and G:C was the downstream base pair whenever there was an upstream A:C, A:G or G:G. Additionally, no barley intron was found, in which the upstream Watson-Crick pair coincided with a downstream G:U or other weak pair. All three branch-point substitution mutants tested were mobile to differing extents with relatively high frequencies (0.67 – 2.02%), indicating that any base at the branch-point position can function in mobility. 100% of these products were true homing events. Although it is specifically the N6 amino group of the branch-point A that is recognized, many lines of evidence suggest that the actual base at the branch site is not required to be an A. Naturally occurring introns have U (11 times), followed by G (5 occurrences) and C (1 occurrence) (Comparative RNA Web Site database: http://www.rna.icmb.utexas.edu/). In aI5γ, G and U at the branch-point were found to allow for some branching to occur . Also, it was observed that even if the branch-point residue was paired, it did not have a large effect on splicing efficiency and no effect on the choice of the branch site . C was also found in the branch-point position in 8/25 ΔA54 homing products. From previous reports it was noted that if the branch-point nucleotide was changed to a C, branching was reduced [20, 22]. In this case it is likely that the sensitivity of our assay permits the detection of homing products. Surprisingly A54G, which demonstrated the highest mobility among these three substitution mutants, was not found in the ΔA54 homing products. It remains elusive how the sequences were changed at positions surrounding the branch-point and why only C, along with wild-type A, were selected at the branch-point, despite the fact that A54G was slightly better than A54C in mobility (Table 1). Two additional combinations of mutants were made. One containing deletions DIVb(1–2), DII(ii)a,b and the κ helix (190–204) that resulted in an intron that was 710 nts in size, and a second one containing an additional deletion of domain Ib, which resulted in a reduction to 694 nts. However, both constructs exhibited no mobility. The largest deletions that preserved Ll.LtrB intron mobility were the 158 nt deletion in domain DIVb(1–2) and the 18 nt deletion in domain IIb. The smallest derivative of the Ll.LtrB intron that retained mobility was 725 nts, resulting from the DIVb(1–2) and DII(ii)a,b deletions (0.23%). The tertiary elements whose deletion does not completely abolish mobility are alpha, kappa and eta. Only the G3A substitution mutant in the catalytic triad of DV was mobile, while the other two mutants were revertants back to G. In DVI, a branch-point nucleotide was found to be essential for mobility. It was also observed that any nucleotide at this position supported mobility to some extent. E. coli HMS174 (DE3) (Novagen, Madison, WI) was used for the genetic mobility assay. The cloning strain was E. coli DH5α. Intron deletions were made by overlapping PCR and cloned into the donor plasmid pACD2 (see  for details). This plasmid carries a ΔORF+ORF version of the intron that contains the T7 promoter in DIV (from which the tetracycline resistance – tet R gene is expressed after homing takes place). LtrA is also expressed from the donor plasmid, but at a downstream location, outside the intron. In this study, the donor plasmid has been further modified to contain a 158 nucleotide deletion in DIVb(1–2). It must be noted here that part of the DIVb helix substructure is maintained by the insertion of the T7 promoter. Domain I deletions that were upstream of the Bsr GI site (intron position 308), were cloned using the Hin dIII and Bsr GI sites on the donor plasmid. Deletions downstream of the Bsr GI site and the point mutants were cloned using the Bsr GI and Pst I sites. All mutants were verified by sequencing. The genetic mobility assay was performed essentially as described in Guo et al., 2000 (Figure 4) . In brief, the donor plasmids (carrying the mutant or wild-type introns) were each co-transformed with a recipient plasmid pBRR3, carrying a promoterless tet R gene downstream of the target site (which are the ligated exons; positions -30/+15). After IPTG induction (100 μM, 1 hour, 37°C) and plating on ampicillin (100 μg/ml) ± tetracycline (25 μg/ml) plates, mobility events were identified as amp R tet R colonies. It is important to note that both the intron RNA and LtrA protein are overproduced in this assay, which might mask more subtle effects of these mutations. Schematic representation of donor and recipient constructs and the homing product. The donor construct (chloramphenicol resistant – camR) expresses the ΔORF version of Ll.LtrB that carries a T7 promoter in DIV. LtrA is expressed downstream of the intron. The recipient plasmid (amp R ) carries ligated exons E1 and E2 – the target site for Ll.LtrB insertion, upstream of a promoterless tet R gene. E1 and E2 are flanked by E. coli rrn B terminators T1 and T2 to prevent leaky expression of tet R . The T7 terminator TΦ is located downstream of the tet R gene. The homing product depicts Ll.LtrB inserted into the target site. At least 10 colonies were picked from each of the selection plates and tested by PCR to confirm true homing events. The PCR primers used were Rsense (recipient plasmid primer) 5'-ACAAATAGGGGTTCCGCGCACA-3' and LtrBAs2 (intron primer) 5'-TTCTCCTACAGATTGTACAAATGTGG-3'. In the case of deletions Id3(i)1 and Id4, the intron primer used was LtrBAs3 5'-GATTCTCGGCATCGCTTTCG-3'. All positive homing products were isolated and sequenced to verify the deletion. In the case of DV and DVI revertants, donor plasmids from the PCR positive homing events were also isolated and sequenced to verify the mutation. True homing events were identified based on all of these three tests – selection on plates containing ampicillin and tetracycline, followed by PCR verification and sequencing. This version of the article differs in several ways from the version that was published as a Provisional PDF on 20 December 2002. A second author (JZ) was added and a considerable number of changes were made to the text, although none of these altered the data or major conclusions of the study. Editorial approval was granted for these changes, which were sanctioned by Alan Lambowitz, in whose laboratory the work was carried out. We thank Alan M. Lambowitz for facilities and support. This work was supported by NIH grant GM37949 to AML, and publication costs were defrayed in part by a Keck Postdoctoral Fellowship to LMD.